Poetry is a concise way of conveying a lot of information. Poetry is a personal experience. Australian poetry is always set in Australia. Poetry is very difficult to understand. Knowing about the poet helps to understand the poetry. Poetry doesn’t fit into the modern world. I like/don’t like poetry because ______________________. Now ask the class to interview each other to find out how the class feels about poetry. Group work: look at the titles of any poems selected for class study. What kind of person do the titles suggest the poet is? What do you think she is interested in? Choose students from the class to read a selection of Harwood’s poems. Students should listen without any script before them and just enjoy the rhythm and ideas in the poems. They can discuss this but the main idea is to enjoy the sounds. After each poem they can write about what they can see or hear as they listen. Does this resonate with anything in their own lives? If you were a poet what events of your life would you write about? Who are the people you would write about? Who would you dedicate your poems to? Poetry terminology: revise poetry terminology with the class if necessary. Direct students to write their own poem about an experience, person, or place that has affected them. Work in pairs to critique each other’s work and offer some editorial advice on: structure, images, line length, rhythm, sounds, punctuation. Reflect on the experience of the rewriting – how important is it to have an editor for your work? One of Harwood’s beliefs was that the first version of a poem was the right one. She rarely changed her poems except for punctuation. Ask students what they think about this? How much thought did they put into their punctuation? I would suggest they just read each poem carefully. Read it very carefully and link it to the other poems. Look at the form of each poem and see how varied they are. Become aware of her as a human being who is writing about her own life and writing as she develops. She’s constantly fighting against an awareness of what time and mortality do to you and what you substitute for a religious belief in terms of belief in human relationships, love of nature, continuity, friendship and, above all, art. Harwood’s poems are lyrical and often challenging, capturing a tonal range and a strong sense of voice. She uses the discursive Augustan mode (witty and ironic). Her insights into the mysteries of language are framed by highly sophisticated complex poetic forms and she plays with traditional form. English Romanticism Her own life. For an overview of Harwood’s themes and some key poems go to Colleen Keene article Gwen Harwood Selected Poems in The Age (February 11, 2013). Harwood is interested in all forms of poetry. She frequently writes sonnets but she also uses the ballad, ode, elegy, narrative, and pastoral forms among others. Many poems have more than one part which, like movements in classical music, may be quite different. In the 1960’s – her first book was published in 1963 and the second in 1968 – the approved poetic convention was free verse and those who practised the traditional structures were criticized as being out of touch and old-fashioned. However, she developed a very intricate type of formal verse which she never really abandoned – she never really went in for unstructured free verse, but her verse did become freer as she developed. She used the sonnet form a lot. She also used the six line-stanza form with an intricate rhyming pattern, and I think that corresponds with the form used by some of the American poets that she was keen on. She was very good at formal verse structures and she did them apparently effortlessly. Look for these different techniques and forms as you read the poems. Voice emerges in the way language is used. Harwood’s poetry is always intellectual and complex in its thinking and yet it is also intensely personal. Her voice is embedded into the texture of the poems, through the words, the structure, the allusions. She locates herself into a literary Australia through her direct references to famous Australian writers who were her friends. Structure, form, word choice, imagery, allusions, line length, rhythm, visual patterns of lines, punctuation – all these make up a style that is uniquely Harwood. At times her poetry is very accessible and at other times it becomes more obscure creating a puzzle for the reader – displaying virtuosity with forms and enacting philosophical ideas of great depth. Sometimes when the reference is obscure she adds footnotes for her reader. Look for unexpected breaks in the lines and listen for the sounds created. Add the syllables in each line and mark the beat on a given line. Another feature of her poems is punctuation or the lack of it: ‘While she rarely made any major alterations, she frequently changed the punctuation and sometimes altered a word or changed one or two lines. Her alterations to punctuation are usually designed to make sense of a passage clearer or to guide the placing of emphasis or pausing in the reading of a poem aloud’ (Hoddinnott and KratzmanCollected Poems p. xxiii). As you read the poems take note of punctuation and indenting considering how this imparts the message of the poem and what it adds to sound and imagery. Look for poems with unusual indentation: At the Water’s Edge, The Waldstein, The Fire Scarred Hillside, Soldier, Soldier and Songs of Eve. All of Harwood’s poems exhibit interesting punctuation so multiple poems could be chosen for study. Good criticism is not about giving a generic reason for techniques or just interpreting lines individually; it is about relating all the parts of the poem to the theme – the bigger picture. Download an annotated version of the poem Memento Homo Quia Pulvis Es Genesis iii. 19 (PDF, 110KB). This is a poem about death which comes to us all. The title is understandable when translated and immediately asserts the theme of mortality so we need to read the rest of the poem with this in mind. All the techniques that you see in the poem should therefore be related to the theme. If we follow the poem closely we see that negative words abound so the poem reinforces the theme of the title and conveys the pain of death through such words as ‘agony’ and ‘monstrous’. Even spaces which can be regarded as techniques need to reflect the theme. Good poetry criticism links techniques to the theme so if the theme is that death comes to anyone the spaces could be a sign that death strikes at anytime and leaves an absence – a hole – in our lives. There is an interesting pattern of rhyming couplets in the first quatrain (aabb) that changes to an alternating pattern (cdcd) in the next quatrain, changes (effe) and disintegrates as the poem progresses. This can be interpreted as the attempt to create a pattern in our lives which we can’t hold on to. Another feature of the poem is the enjambment which in contrast to the idea of death suggests continuity as each line flows into the other. Given the negativity of this poem, this could be seen as an attempt to cling to life. Here is the beginning of a response – responses need to have a clear argument and techniques need to support the argument and not drive it. Memento Home Quia Pulvis Est Genesis iii. 19 is an existential poem about mortality, a theme that preoccupies Harwood in many of her poems. The Biblical allusion that begins the poem is balanced by a scientific allusion to galaxies at the end of the poem, bringing together Harwood’s religious beliefs with an intellectual approach. The structure of the poem reflects the struggle for life against inevitable death. 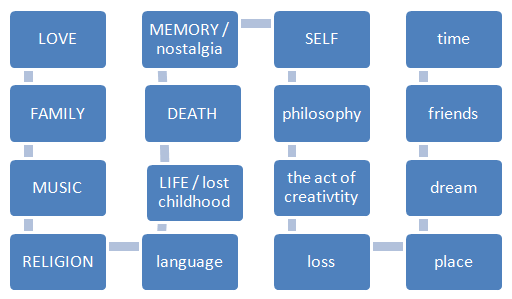 A rhythm from rhyming couplets (aabb) to alternating rhyming lines (cdcd) disintegrates to suggest the loss of control over life while the enjambment linking the lines becomes an attempt to connect to life. Disconnection is further indicated by spaces and indenting in the poem. Have students complete this response. The poems are mostly written in the first person, frequently addressed or dedicated to friends. In her character poems she captures different perspectives. In her poems on childhood, especially the two poems in the Father and Child series, she is able to return to a childlike state with emotions of guilt while offering an adult perspective. The layering of time and perspective is a repeated element in her poetry. Direct students to undertake a close study of the poems in Father and Child (page 275). Harwood’s oeuvre includes two series of poems on the characters: Professor Eisenbart and Professor Krote, both intellectuals of some age whom she treats with disdain. The Eisenbart series is earlier and less extensive than the Krote series. Krote with his musical training is relegated to teaching young girls the piano. Harwood’s strength as a poet is in the way she enters their minds, capturing their dissatisfaction through a single scene which she carefully unpacks. The sense of regret and failure pervades these poems. Explore these poems about character: Prize-Giving (Eisenbart, page 49) and Professor Kröte (page 118). Note: many of the poems about Kröte and Eisenbart have sexual undertones. Many of Harwood’s poems are about acts of creativity and creative people. When she writes about music, poetry and art she is often invoking a Romantic sensibility about genius and the act of creation. Sometimes creativity is central to the poem; other times it adds an additional element. She sees this as a gift which is to be valued. In the Kröte series of poems, music loses its spark as it degenerates into teaching of children and lost opportunities and past accomplishments. She uses music as a theme or as an identifier of people’s personality. What features of the sonnet form do you find in this poem? What is the effect of having a nameless mother? How is the past presented? And how is the present presented? What does the poet mean by ‘subject and counter subject’? What is the significance of the dead mouse? What is the significance of the last line? What is the role of music in this poem? Why would this poem be regarded as a feminist poem? Compare this poem to Alter Ego on music or to In the Park on the housewife. Despite her protestations that her poetry was not about her life, the places she writes about are clearly familiar and often named (Mornington, North Hobart, Sydney, Venice) and her descriptions are strongly lyrical capturing a Romantic sensibility. Listen to the YouTube presentation on the poem At Mornington by David Evans. How successful do you think this presentation is in capturing Harwood’s themes? we sort and sift and rearrange. Things have been past, and will be future. Oh yes, I think memory is something that unites her poetry all the way through, and also she sees time as the enemy. Time has to be fought off and one of the ways you fight it off is by recording the past in poetry – so that poetry endures . . . Fear of time and mortality and the attempt to build defences against it, in terms of family love, sexual love, memory, music – all forms of art that record the present moment and transmit it to future generations. Look for the way time is explored in the poems you are studying. Select one of the themes explored above and read the suggested other poems (alternatively locate another theme you want to explore). Write a comparative essay on the way the chosen theme is developed in Harwood’s poetry. You will need to take note of the dates of publication and the context of each poem as this may influence your interpretation. in the net of language. Harwood was influenced by many philosophical ideas. While Wittgenstein and Heidegger are specifically addressed in some poems, their ideas pervade other poems. 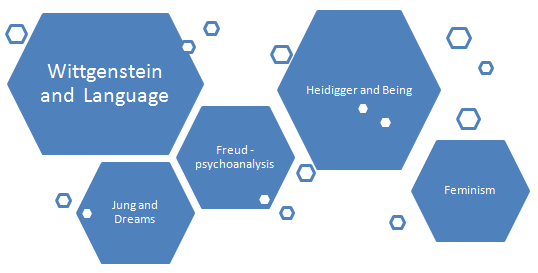 One can also see evidence of the psychoanalytic theories of Freud and Jung’s theories of dreams in many poems. Harwood has been called a feminist poet because of such poems as In the Park and Suburban Sonnet, which come at an early stage of motherhood but later on she is critical of these poems ‘wishing she’d never written about that dowdy housewife and her brood’ (‘Later texts’ in Harwood’s collection The Present Tense, 1995). Read one of the following poems. Copy down lines that capture interesting ideas and think about what they mean. Then conduct research into the theory. Read the poem again and see if the research has changed your interpretation of the poem. First reading: read the poem and think about the images and the words. Second reading: watch and listen to the YouTube video on ‘Barn Owl’. What mood is the video trying to evoke? List the images that appear. Which one stood out for you? Describe the music that is used. How effective do you think this interpretation is? There is also internal contrast in each stanza: light – dark; youth – age. Why is contrast so important in the poem? Why is the first part called ‘Barn Owl’? Rhythm – how many syllables are there in each line? Is this consistent? Trace the rhyme pattern. Is this consistent? Why does Harwood adhere to a rhyme pattern in this poem? How does this develop the ideas of the poem? Harwood alludes to Shakespeare’s play King Lear in the second part – especially in the last two stanzas. Find out what the play is about and comment on the effect of this allusion. Locate any significant images – these may not be metaphors or similes but can be carefully organised descriptions. In the first stanza the adjectives ‘horny’, ‘obedient’, and ‘angel-mild’ create a contrast. Find any other contrasts in the stanzas. What are the ideas about life and death and family in this poem? What is it about ‘Barn Owl’ that appeals to you? Is Gwen Harwood’s work typical of her generation? How is family evoked in ‘Barn Owl’? How does Harwood use wit? Has this interpretation made you rethink the way you see the poem? Father and Child is two poems with quite different sets of images. ‘Barn Owl’ is full of imagery from Blake: ‘old No-Sayer’ and the child ‘obedient angel-mild’. The ‘old No-Sayer’ is the God of the Old Testament. The second one, ‘Nightfall’ takes its imagery from King Lear – ‘Be your tears wet’, ‘Ripeness is plainly all’. Her father is, like Lear, ‘four score and upward’ and he’s blind. So he’s both Lear and Gloucester. I always admire the phrases she uses about old age, like ‘time’s long-promised land’, which echoes the biblical reference to the Promised Land, but it makes it much darker by transforming it from an image of an attainable ideal to an image of the inevitability of ageing. ‘Nightfall’ is a splendid poem. I like it better than I like ‘Barn Owl’ . . . ‘Things truly named can never vanish from earth’. The job of a poet is to name things truly. The father used to name objects in the natural world for the child and, now that he is blind, the child must name them for him. Naming ensures continuity and connectedness. She frequently writes about innocence and experience. At first the child doesn’t really understand about death. When you’ve gained experience you bring all these darker aspects into your field of consciousness. The child in ‘Barn Owl’ learns through experience. How important is it to read and listen to other people’s interpretations and to understand the theoretical background to the poetry? How does Harwood’s poetry compare to her contemporaries? Judith Wright is a contemporary poet of Harwood’s. Look at the poems Songs of Eve by Harwood and Eve to Her Daughters by Wright. How does each poet use the story of Eve to convey a message? What is the message of each poet? Can you see any connection in the way they write or what they are writing about? How has Harwood influenced the next generation of Australian poets? Felicity Plunkett is a recent Australian poet whose poetry resonates with Harwood’s poems. Read Father and Child and The Glass Jar by Harwood (and other Harwood poems centred on family) and Plunkett’s poems Ferrying, Kindergarten and Learning the Bones in her book Vanishing Point. Construct a comparative table of the way these two poets explore family and death. Consider images, allusions, structure and the voice in each. What similarities and differences do you see? (alternatively you could look at the poets who have won the Gwen Harwood Memorial Award to trace the way poetry has developed during the period of the competition). As representative of Australian culture. As significant to literature and the world of texts. Read Professor Dixon’s essay on Australian literature’s relationship to world literature (“Australian Literature and the World Republic of letters”. Metaphor 1, 2013). Or watch him speaking about the Australian Canon on YouTube. Alternatively, watch Sophie Cunningham and Joseph Gelfer discuss Australian literature. Where does Harwood fit in the different periods of Australian literature cited by Dixon? How does Cunningham’s definition of Australian literature position Harwood’s poetry? Go back through Collected Poems and look at the dedications – Harwood has very close friendships with other Australian writers (Dorothy Hewett, Vivian Smith, A.D. Hope). Consider where they stand in Australian literature. Do some research on Harwood’s awards and reviews of her work. How do her references to other Australian poets and the comments of reviewers affect our assessment of Harwood as an Australian writer? Then consider Harwood and the world: think about the links to the world beyond Australia. Look at the range of references and allusions in Harwood’s poems. What does this show about the way she connects to the world? Offer a summary of your findings in a table under the headings Australian poet/World poet. Read the essay by Bonny Cassidy attached to this unit and the introduction to Collected Poems. List all the techniques and stylistic devices mentioned. Working in groups, students search through five poems per group to find their own evidence for the devices that are listed. Use the wall for charts on each device. Use post-its. Copy interesting images and other examples and place these on the appropriate chart. Spend some time reading the charts. Students may start to see some patterns developing in the range of references and images in the poems. From this exercise students come to an understanding of the motifs and themes that link the poetry. Back in groups the students will collect their findings and report back to the class. Harwood is an international poet rather than an Australian poet. Present a mini debate with one student arguing that Harwood is an Australian poet and the other that she is an international poet. Students will need to support their arguments with evidence from the poems. The class can vote on which argument is the more convincing. To what extent can Harwood be regarded as an Australian poet? Present this orally as an argument supported by a PowerPoint. Read the article by Professor Robert Dixon on Australian literature and internationalism for a definition of Australian literature. Look at Harwood’s concerns in her poetry. Consider the dedications and allusions in her poetry. How does each position Harwood? Addressing and justifying any revisions to their initial response. Developing a coherent, conclusive statement of understanding regarding the text and its themes, structures and or techniques as applicable. Reflecting on awareness of the text’s wider cultural value. Reflecting on one’s own processes of responding to and creating other texts. Design a multimedia presentation on the influences on Harwood with carefully selected passages from poems. Carefully consider the music to be used and the way the ideas are to be arranged. Write an explanation of what you were trying to do and how you constructed the multimedia show. You might find it helpful first to critique this YouTube presentation on At Mornington. Watch a selection of presentations from the class and write a response to the representations noting what you perceived to be the strengths of each composition and also suggesting some ways of enhancing the presentations. In groups you may want first to design a criteria sheet to guide your response. To what extent is Harwood’s poetry life writing? Present this orally as an argument supported by a PowerPoint. Read the introduction to the collected poems. ‘The power of Harwood’s poetry lies in her deep understanding of how language works.’ Present this orally as an argument supported by a PowerPoint. Read Bonny Cassidy’s essay attached to this unit and the journal articles by Atherton and Hoddinott (see ‘Articles’ below). ‘You said, “We live two lives. Atherton, C. “In the dreaded park: Gwen Harwood and sub-personality theory.” Journal of Australian Studies 84 (2005): 133-140. Hoddinott, A. “Memories, moments and musings about Harwood.” mETAphor 1 (2013). Hoddinott, A. and Kratzmann, G. eds. 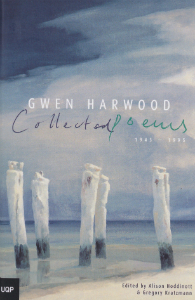 Gwen Harwood Collected Poems 1943 – 1995.University of Queensland Press, 2003. Davidson, T. “The Lonely Seas and Dream Guests: Two Approaches to the Inner Poetics of Age by Australian poets Ada Cambridge and Gwen Harwood.” Faculty of Arts and Education, Deakin University. Dixon, R. “Australian Literature and the World Republic of letters”. mETAphor 1 (2013): 3-11. Hoddinott, A. “Memories moments and musings about Harwood.” mETAphor 1 (2013). Kucas, R. “Lines of confusion, stones of emptiness: the place of mourning in Gwen Harwood’sHerongate.” Southerley 65.3 (2005): 146-55. Priest, A. ” Between Sanctity and Liberation: The Lives and Loves of Gwen Harwood.”Southerly 70.2 (2010): 158-179. Wood, A. “Operatic Narratives: Textual Transformations in Gwen Harwood’s and Larry Sitsky’sGolemand Lenz.” Journal of the Association for the Study of Australian Literature 5 (2006):173-190. Find a summary table for Australian Curriculum: Literature Senior Secondary content descriptions for this unit. MEL DIXON has taught English in two states at regional and city schools for nearly 30 years, and was a Head of Department for ten years. She is presently the Resources Officer for ETA NSW and editor of the journal Metaphor, and previously editor of Words’ WorthETAQ. She has published chapters in various English textbooks on the Australian Curriculum, Language and HSC English.